So I have my work cut out for me! On the plus side, the body feels weighty and substantial and the neck looks good. I reckon all the rest is fixable with these two good fundamentals. 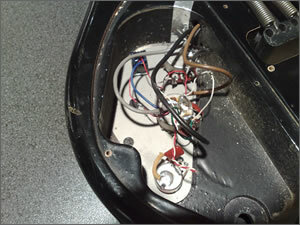 In a flurry of enthusiasm I stripped the whole thing apart, unsoldered the remaining wiring, removing the pickups and bagging everything for later investigation. I had two pieces of luck straight away…my parts box gave up a matching machine head ferrule and I had a spare Tremelo arm, bought for my Squier Strat but the wrong thread..it fits the Westone perfectly! The body will need sanding, filling and re-spraying, and I won’t be returning it to black…I feel like a new colour and the current condition Â is so poor a refinish won’t harm the guitar’s value. I’m thinking maybe a darkish metallic blue/grey colour I have seen…A Volvo car colour. IÂ have also toyed with the idea of metal pickup covers, but it seems pointless buying parts until I know if they work or not. 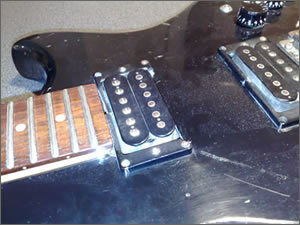 I may need two new humbuckers. Next post I’ll begin the rebuild. Thanks for reading!